If oatmeal is your go-to breakfast or a standard light dinner when there’s nothing in the fridge, you can still enjoy this nutritious whole grain when you embark on a low-carb diet. 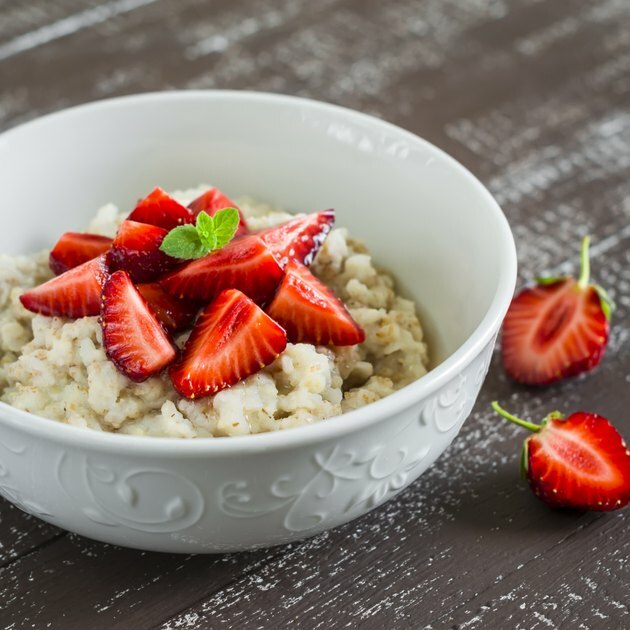 Depending on the low-carb plan you choose, though, you may have to postpone eating oatmeal until you’ve graduated to a later phase of the diet. When you’re ready to add oatmeal back into your regimen, look for brands with the highest fiber count to reduce the total carb load of your meal. Although they differ slightly in recommendations, all low-carb diets follow a basic principle: You significantly reduce the amount of carbohydrate you eat while boosting the protein and fat in your diet. The National Academies of Science has set the adequate intake of carbs for children and adults at 130 grams of carbohydrate per day, or 45 to 65 percent of calories, so technically anything less than that would be “low-carb.” The National Center on Health, Physical Activity and Disability says a very-low-carb diet has 20 to 50 grams of carbs a day, while a low-carb diet is 30 to 130 grams daily. With two of the best-known low-carb diets, Atkins and South Beach, you progress through phases in which you drastically reduce carbs, then gradually add more back in once you’ve lost some weight. On the classic Atkins diet – called Atkins 20 – you start out with only 20 grams of carbs a day, and you do not eat oatmeal or other whole grains until Phase 3, when you are eating 50 to 80 grams of carbs a day. This could take several months to reach because you need to be within 10 pounds of your weight-loss goal. In contrast, in the South Beach diet you cut out grains for the first 14 days, then add foods like oatmeal back in during Phase 2. Atkins 40 is a less rigid form of low-carb dieting, in which there are no phases and you eat any carbs you want from day one – as long as you don’t exceed 40 grams a day. When you’re 10 pounds from your target weight, you can add another 10 grams of carbs a day. Continue upping your daily carb intake by 10 grams each week until you hit your weight-loss goal. Whenever you opt to eat oatmeal on your low-carb diet, selecting a variety or brand that’s higher in fiber will keep your total carbohydrate count in check. That’s because low-carb diets like Atkins base their carb counts on “net carbs” – that is, total grams of carbs in a serving of food minus grams of fiber and sugar alcohols. The Atkins Carb Counter provides the carb counts of some generic types of oatmeal, along with serving sizes. One-quarter cup of dry steel-cut oats or rolled oats provides 12 net carbs, while a packet of plain instant oatmeal gives you 16 grams of net carbs. Flavored oatmeal is much higher in carbs; for example, a packet of instant cinnamon spice oatmeal has a whopping 33 grams of net carbs. With plain oatmeal, watch what you add to your cereal to limit your carbs. A half-cup of blackberries or red raspberries, with just 3 grams of net carbs each, or the same serving of sliced strawberries with 5 grams, would make better fruit additions than a small banana, which has 20 grams. Prepare your oatmeal with water to avoid the carbs in cow’s milk, or try plain unsweetened almond milk, with just 1 gram of net carbs per cup, or unsweetened soy milk, with 2 grams per cup. You can use less oatmeal by enjoying plain yogurt for breakfast and simply sprinkling a little dry oatmeal on top. A 4- to 6-ounce serving of plain Greek yogurt has between 5 and 7 grams of net carbs. Or you could trade your oatmeal for a lower-carb grain like quinoa, which has just 9 grams of net carbs in a 1/4-cup serving. You can prepare quinoa as you do oatmeal, with water and served with berries and plant milk. Other whole grains that could fit into a low-carb plan – and which have larger serving sizes – include buckwheat groats and grits, each with 15 grams of net carbs per 1/2 cup. For more protein, serve your hot grains with a poached or boiled egg on the side, with less than half a gram of net carbs. Can You Have Wheat Bread on a Low-Carb Diet?